Blessed be God, at the end of the last year I was in very good health, without any sense of my old pain but upon taking of cold. I lived in Axe yard, having my wife and servant Jane, and no more in family than us three. My wife, after the absence of her terms for seven weeks, gave me hopes of her being with child, but on the last day of the year she hath them again. The condition of the State was thus. Viz. the Rump, after being disturbed by my Lord Lambert, was lately returned to sit again. The officers of the army all forced to yield. 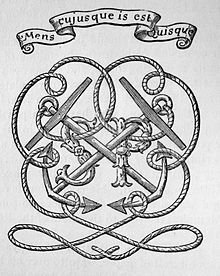 Lawson lie[s] still in the River and Monke is with his army in Scotland. Only my Lord Lambert is not yet come in to the Parliament; nor is it expected that he will, without being forced to it. —  Diary of Samuel Pepys, January 1660. 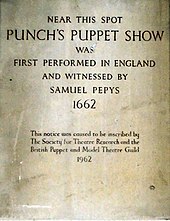 ^ Pepys, Samuel (2000). Latham, Robert; Latham, Linnet (eds.). A Pepys anthology : passages from the diary of Samuel Pepys (1. UK paperback ed.). Berkeley [u.a. ]: Univ. of California Pr. ISBN 978-0-00-710530-4. 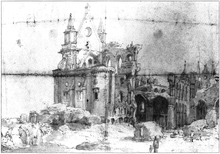 ^ Diary of Samuel Pepys, Sunday, 31 December 1665. 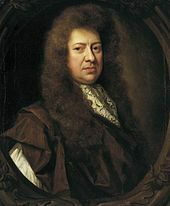 ^ Diary of Samuel Pepys, Monday, 31 May 1669. ^ Anomymous (3 January 1995). "The Diary of Samuel Pepys: A Radio 4 Classic Serial (BBC Classic Collection)". www.amazon.co.uk. BBC Audiobooks Ltd. Retrieved 18 September 2015. Pepys, Samuel (2004). C. S. Knighton (ed.). Pepys's later diaries. Stroud: Sutton. ISBN 0-7509-3656-8. Pepys, Samuel (2005). Guy de la Bedoyere (ed.). Particular friends: the correspondence of Samuel Pepys and John Evelyn (2nd ed.). Woodbridge: Boydell & Brewer. ISBN 1-84383-134-1. Pepys, Samuel (2006). Guy de la Bedoyere (ed.). 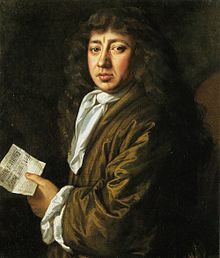 The letters of Samuel Pepys, 1656–1703. Woodbridge: Boydell. ISBN 1-84383-197-X.